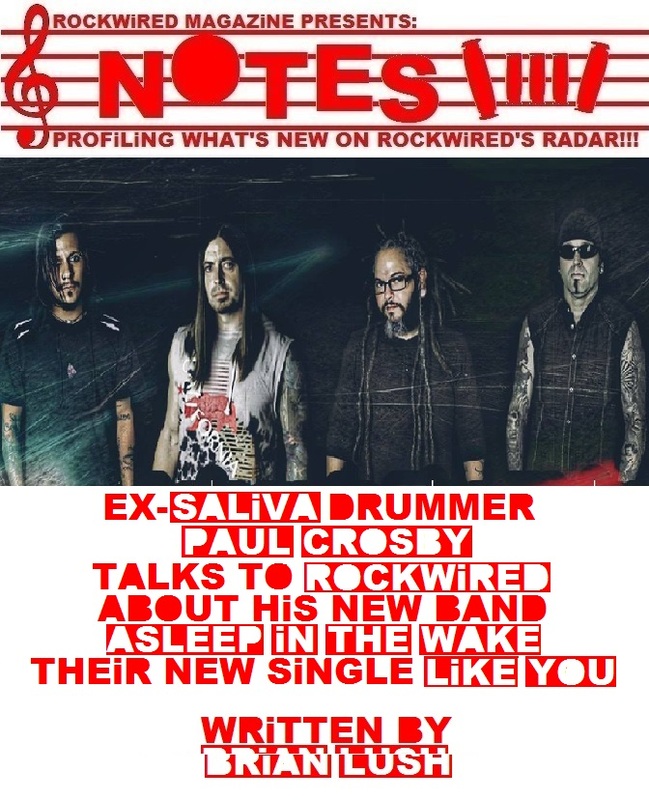 "ROCKWiRED NOTES: ASLEEP iN THE WAKE | EX-SALiVA DRUMMER PAUL CROSBY TALKS TO ROCKWiRED ABOUT HiS NEW BAND ASLEEP iN THE WAKE, THEiR NEW SINGLE "LiKE YOU" AND THEiR FORTHCOMiNG ALBUM!!!" he decision to leave a successful rock band to satisfy an artistic itch sounds like an unenviable decision to have to make. For almost twenty years, PAUL CROSBY served as the drummer for the GRAMMY nominated hard rock band SALIVA and was there to experience first-hand the band's ascent to the top of the Modern Rock and Active Rock charts with such hits as the GRAMMY nominated single YOU'RE DISEASE, ALWAYS, SURVIVAL OF THE SICKEST and LADIES AND GENTLEMEN. The accolades and the chart action would be enough for most, but CROSBY craved more of a hands-on, collaborative songwriting process. 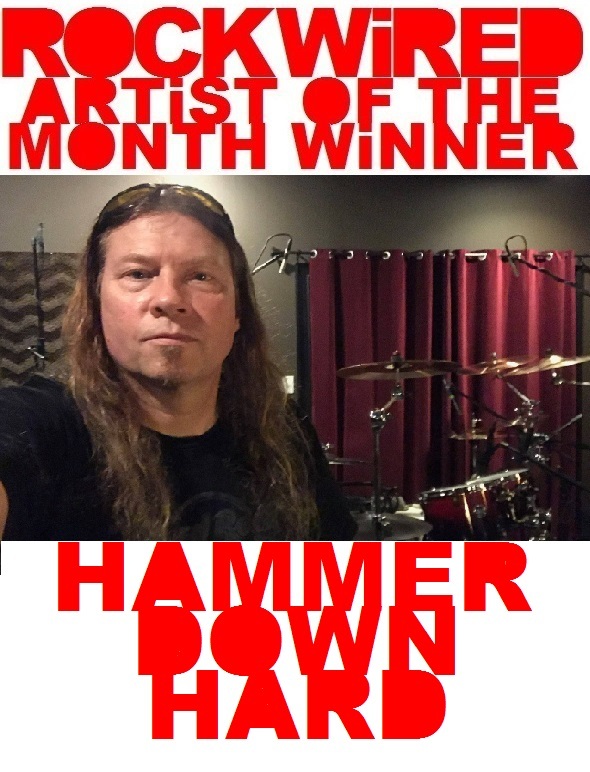 Earlier this year, CROSBY stepped away from the SALIVA juggernaut and sought artistic satisfaction in his own backyard of Houston, Texas with former members of the bands SATURATE and MELLOVINE. Together, they have created the band ASLEEP IN THE WAKE who are on the verge of issuing a new album sometime in November. To get the fires stoked, the fledgling band has released their first single in the slow burning rocker LIKE YOU. ROCKWIRED had a chance to speak with CROSBY regarding his decision to leave SALIVA and the formation of his new band ASLEEP IN THE WAKE. Here is how the interview went. For years, you were the drummer for the band SALIVA - which ha been quite a juggernaut in the world of active rock - and now, you are stepping out of that doing your own thing with ASLEEP IN THE WAKE. How does it feel to break away from a successful band like SALIVA and do this? It feels good for me because it's a fresh change and a fresh start. It feels good! I wanted to try to be in a more relevant band again. With SALIVA throughout the years, the success was great but we all lived in different states and we weren't really writing together anymore. Everyone was kind of writing on their own. When you don't live together, you can't really get together, jam and write so it's really refreshing to be in a band here in Houston, where everyone in the band lives and we can get together for rehearsal. As a band we can sit down and write stuff together and it feels awesome. 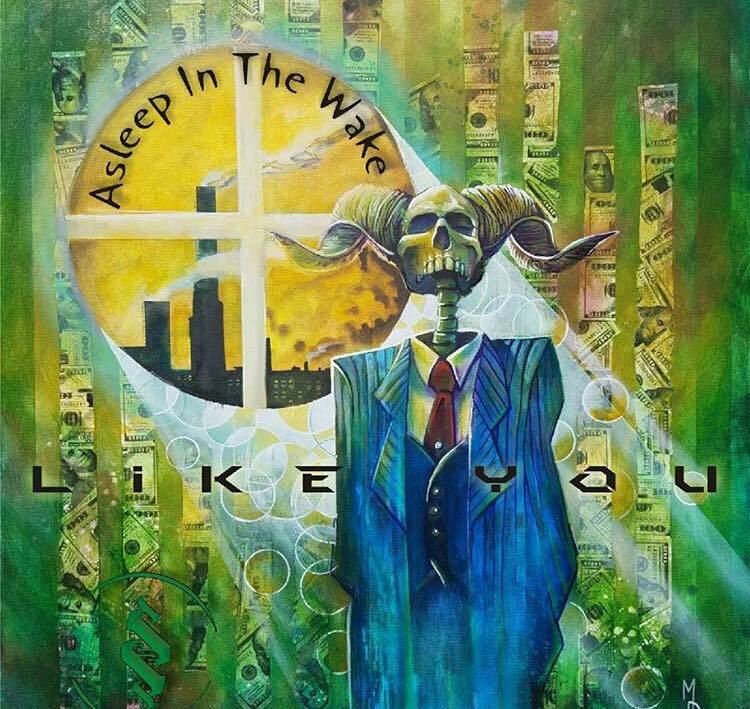 CHECK OUT THE NEW SINGLE LiKE YOU!!! I guess this is going to be the chicken or the egg question. Did you have musical ideas of your own while you were in SALIVA or did the need to do you own thing come first? I wanted a change, so that came first. Wanting a change had been on my mind for the last couple of years and at first, I was just going to focus on producing bands and managing bands which is something that I also do. But then some of my friends, who were in a band that is pretty well known here in Houston called SATURATE had just broken up and they put out some feelers asking if there was anyone out there who just wanted to get together and write. I have a studio so I invited them to come over and I would help track their ideas for them. That was all it was and then, I played drums on these ideas while the guys were tracking these ideas and then all of a sudden and the stuff started coming out sounding really good. It was after a few of those sessions where we realized that we were a band now. After that, we went full speed ahead and started recording the record and putting everything into motion at that point. What is inspiring this new set of songs for this new band? Thematically, where are these new songs coming from? The way we're approaching the music is with no preconceived concepts. Everyone gets together and just starts jamming. Whatever comes out comes out but what comes out is a mesh of all of our respective influences from throughout the years. It definitely doesn't sound anything like SALIVA and it definitely doesn't sound like anything from SATURATE. It's a whole new thing. People are going to have to hear it and make their own judgement on that, but we're loving where it's going though. Talk about the other members of ASLEEP IN THE WAKE. Tell me who they are and what it is that you think each of them brings to the table that makes this thing work. Well, we have MIKE MEXAS on guitar and he was one of the people that was in the band SATURATE. I can't describe him. He's just got that writing thing dow cold and comes up with these non-stop endless riffs. He throws out these riffs on the fly that end up being the basis for really good songs. On bass guitar, we have HECTOR PORRAS, who was also with SATURATE. He is a monster bass player! Our singer is MATT NIECE and he was in a band in the Houston area called MELLOVINE. When that band broke up, a couple of members of that band ended up forming the band TO WHOM IT MAY whose record has just come out and they got a record deal with G4L RECORDS. I've gotten to know the guys from TO WHOM IT MAY recently. Yeah, so with this project, we got the best of the Houston musicians that weren't doing anything and it's turned out to be pretty cool. What got you started in wanting to get behind a drum kit and make this thing you do for a living? How did that start? I have an adopted brother and when I was a kid, he played the drums. I'm not gonna say that he was drummer. He simply played the drums. Of course, he'd probably kill me if he heard me say that. When he first moved in with us, he didn't have a drum set. He would air drum and I would just look up to him. Instantaneously, that was what got me hooked into wanting to play the drums. At some point, I met a kid with a drum set and he taught me my first drum beat. As soon as I played that first drum beat, I was like "Oh my God! I want ot do this forever!" It lit the fire in me that made me want to go for it. I didn't have a bunch of people teaching me after that. I would just listen to my favorite bands at the time. This was 1984, so that was a lot of METALLICA, MOTLEY CRUE and SLAYER. I started mimicking what I heard and it all just kind of went from there. The rest is history. You guys have released you first single LIKE YOU about a week ago. So far what kind of reaction have you been able to gauge? Everything has been going better than expected. It's getting a lot of views and a lot of downloads and we're really happy with the response. We've started to create a buzz very quickly. That was kind of our goal and it seems to be panning out. Why was that one earmarked as the single? For a couple of reasons. One, we're in the process of recording the entire record and we wanted to have a single out there in the meantime, while we're finishing the record, in order to get the buzz going. On top of that, of all of the three songs that we did have completely mixed and mastered, it's the heavier of the three, and since this is our first single ever as band, why not go with the heaviest? We have a whole record full of really killer songs as well, but I wanted to come out on a heavier note in order to introduce us to the world. Earlier you said that you have your own studio. Are you producing this album yourself? Yeah. I'm actually engineering and producing the whole record. What is the roll out for this album going to be. How soon can people expect it? We don't have an official release date but we'd like for it to be out by late-November, if we're being conservative about it. As of right now, we are still doing this whole thing on our own, however if a label happened to step in, all of that stuff could change but tentatively, we're looking at some time in late-November. rian Lush is a music industry professional and entrepreneur. In 2005 he launched the online music site Rockwired.com to help promote new music artists in conjunction with the weekly radio show Rockwired Live which aired on KTSTFM.COM from 2005 - 2009. In 2010 He launched the daily podcast series Rockwired Radio Profiles which features exclusive interviews and music. He has also developed and produced the online radio shows Jazzed and Blue - Profiles in Blues and Jazz, Aboriginal Sounds - A Celebration of American Indian and First Nations Music, The Rockwired Rock N Roll Mixtape Show and The Rockwired Artist of the Month Showcase. In 2012, Brian Lush and his company Rockwired Media LLC launched the monthly digital online publication Rockwired Magazine. The magazine attracts over 75,000 readers a month and shows no signs of stopping. Rockwired Magazine also bares the distinction of being the first American Indian-owned rock magazine. Brian Lush is an enrolled member of the Yankton Sioux Tribe. Brian Lush's background in music journalism, radio and podcast hosting, podcast production, web design, publicity, advertising sales, social media and online marketing, strategic editorial planning and branding have all made Rockwired a name that is trusted and respected throughout the independent music industry.